Kevin knew, long before he made his challenge, he had next to zero chance of winning. Every political commentator in the Australian media said so and most even had the approximate number of votes Kevin was likely to get about right. Even Kevin himself was quoted as saying he expected to loose this ballot according to ABC1's Media Watch Show which aired on the 27th February 2012. The Australian Media have been hounding Kevin Rudd about the possibility of a leadership challenge for months. Speculating when he is best likely to make a challenge so as not to be too close to the next election. Kevin may have even toyed with the idea of actually making a challenge at some time in the past but was never really serious about it. Or maybe he was... I don't know? What I do know is that the media have been building this story to the point where nothing else the government does matters much any more. It's all about the Leadership and who's more popular with the Australian public. Who gives a toss. Even now, after Julia's decisive win, the media is focusing on retribution. 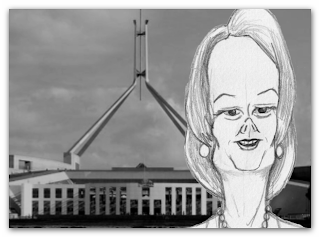 Will Prime Minster Gillard bring down the axe on everyone that voted for Rudd and send them all to the back benches? Seriously. Julia has already said she's about unifying the party and getting on with government with a view to winning the next election decisively. Retribution is hardly a unifying step forward. As a voting member of the Australian public I'm perfectly happy with Kevin as Foreign Minister. In fact I think he should be reinstated. He's clearly the best person for the job with his ties in the Asia/Pacific region. Julia's not my favorite person for PM. She's too diplomatic and constrained by her party advisers. In fact the best thing about the leadership challenge has been hearing Julia actually sound like she's speaking her mind instead of the party line. She's no Bob Hawke or Paul Keating... yet. Whether or not those two former PM's spouted the party line or not you at least felt like the words coming out of their mouths were what they believed in - almost to the point of it sounding like it was all their ideas. But back to Kevin. I have no doubt he wants to be Australian Prime Minister again. He's a career politician very much in the same mould as former Liberal PM, John Howard, who is one of politics great survivors. John went through various ups and downs over many decades with the Liberal party before finally becoming one of its most successful leaders and Prime Ministers. It is only my opinion but, since Kevin knew he had next to no chance of winning a leadership ballot, he probably only challenged simply to shut the Australian media up on the issue. In doing so, his support within the Labor party would be crystallized into a clear number that shows the majority of the party are not actually dissatisfied with Julia in the top job. (As the Australian media seem to want us to believe). Even if Kevin never makes another challenge during this government's term he knows he's still got a shot at the leadership of the Labor party at some point in the future. He knows he's popular with the people, he's the most experienced person in the Labor cabinet and he's not about to resign. Whatever his party don't like about him, he can work on. Perseverance - that's what the life and times of PM Howard's rise to the top can teach Kevin. Kevin is not an idiot. He may have talked up his chance at actually winning the ballot purely to put on a show. Apparently Kev's good at that. Being one thing in public and another when the media isn't on him. This challenge needed to look serious in order to shut the media up. Kevin's not disappointed. Julia's not upset with him. Everyone goes back to the business of government with the obligatory cabinet reshuffle so the media can read more into that than there actually is and, hopefully, the news can report on real issues. The Australian media are mostly a big disappointment. They want to turn the news into some kind of soap opera that they imagine is entertaining for their readers. Especially when it comes to government. Like government is some kind of reality show. Your average Australian only cares about who is their preferred Prime Minister when they have to vote in an election. Do we really need a running poll on who's popular this week as PM? Or which party would win if an election was held today? It's meaningless crap. The fact is we voted on the government we have and that's what we got. I just want to know what they're doing as a government and whether the things they're are doing are working. I want to know what the people opposing the government are saying and what they think the government should be doing as an alternative. I don't need yet another photo opportunity of opposition leader, Tony Abbott, out in the community trying to mangle together some quote about the government in relation to whatever bit of machinery it is he's trying to operate this week. Tony, for heaven's sake, stop setting up photo opportunities and start planning a proper alternative government. Opposition isn't just saying 'No it isn't' (ref: Monty Python's 'Argument sketch'). There seems to be a perception in the media that politics is boring so it has to be made interesting with drama otherwise people won't care. As Henry Rollin's once said about TV "They're spitting on your mind". There are so many interesting aspects of government that affect people daily. Why can't we see more of that as the headlining story instead of who's more popular as PM this week?